In the amazing and beautiful story of the birth of Shmuel, we are presented with the powerful prayer of his mother Hannah. Hannah was afflicted with one of the the worst issues which bothered people in the ANE, not having children. Many cultures were troubled by this issue, and many stories were written to depict the tragic stories, and how some of the characters were given their greatest wish. As explained in my article on blessings and the root of the word ברכה, having children is the greatest blessing given to mankind by God. Hannah, out of despair, prayed in an unusual fashion to YHWH asking him to give her a child. 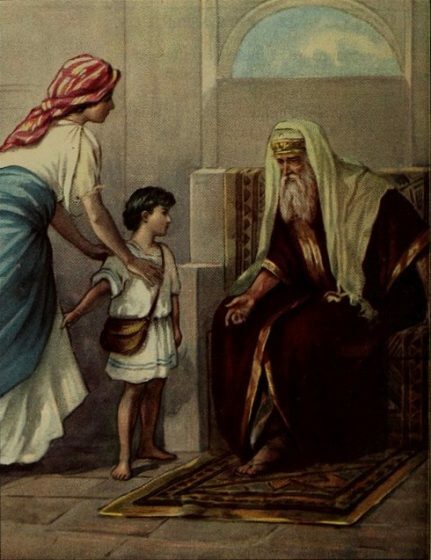 In response Eli, the high priest, gives her a blessing that she will see children. “Then ‘Eli replied, “Go in peace. May the God of Isra’el grant what you have asked of him” (1 Sam 1:17). When was the prayer answered? The common denominator in all translations is that Hannah had gotten back to her home with her husband, and at some point she became pregnant. None of the translations deal with one important word which gives us a better understanding of what happened. The word in question is לִתְקֻפוֹת. The word comes from the root הקפ/יקפ (or נקפ/קופ) and means “to circle”. When this specific word is used to indicate a time reference, it is when time passes in a circle, meaning that the same time has come back. In our case it is placed together with the word הַיָּמִים- the days, which is synonymous with years, but can be used for time in general. The form used here is a plural in both, making it clear that we are not looking at the passing of time for pregnancy, but of a different time. If we were looking at just pregnancy, the word would have been תקופת הימים, where the word תקופה is in the construct singular, indicating one period of time. Instead we see it in the plural construct, leading to an understanding that it is several times which have passed. We can also add that the passing of time is in relation to the visits of at least two years which had passed, if not more since the birth. Assuming this is the correct interpretation, Hannah seems to not have been bothered by the amount of time, and had a firm belief that her prayer will be answered, even if it was not immediate. For intellectual fairness, it is my obligation to present the different explanations given to this term. “1S 1:20: the expression can be understood in two different ways: —a) at the turning of the year, at the beginning of the new-year, so Stoebe KAT 8/1: 89, 92 (with bibliography); see also F. Stolz Das erste und das zweite Buch Samuel (Zürcher Bibelkommentare, AT 9; 1981) 24; cf. also KBL. —b) at the turning, meaning at the end of the days (the period of the pregnancy), so Kutsch loc. cit. 20; cf. TOB when the days were fulfilled; NRSV and REB: in due time. Koehler, L., Baumgartner, W., Richardson, M. E. J., & Stamm, J. J. (1994–2000). The Hebrew and Aramaic Lexicon of the Old Testament (electronic ed., p. 1784). Leiden: E.J. Brill”. The reason the dictionary has the second definition, is based on an isolated look at the specific case of our verse, but is a limited way of looking at things and does not take into consideration the overall meaning of the word combination. Though this combination is given only once in the Tanakh, it is my understanding that one appearance does not always give the full definition. Many scholars agree that our knowledge of BH is limited by the relatively narrow corpus of text we have. It has happened before that an isolated use has a much larger meaning, and that meaning is exposed by a specific breakdown of the words, and by findings in writings outside of the Tanakh. Hence it is my opinion that the second interpretation be rejected as an isolated understanding and not a representation of the actual use. What can be seen from this example is that though the text seems to give us a short time from prayer/blessing to fulfillment, we actually have a longer time which has passed. We do not have an exact time given, but it was not a short one. We have also presented a specific definition to the one time appearance of the word combination, which is linked to the specific time line of the story theme of visiting Shilo. This shows us that an isolated definition cannot explain the meaning of a term, and a much larger idea is actually presented. It is not the term of pregnancy, but the time between visits being referred to. This being the case, the use of the plural is understood better because a pregnant woman does not go through several pregnancy periods.